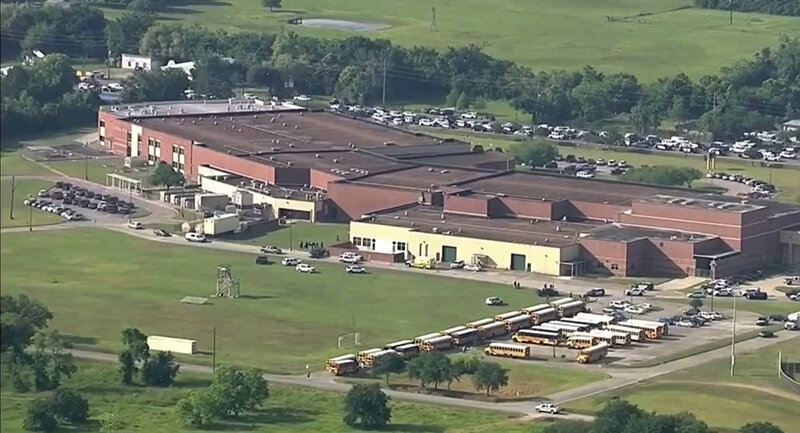 Ten people were killed and 10 more injured in a shooting at a high school in Santa Fe, Texas, Friday morning, Texas Governor Greg Abbott confirmed that afternoon. He called the shooting "one of the most heinous attacks that we've ever seen in the history of Texas schools." Earlier in the day, police arrested a male believed to be a student at the school in connection with the shooting, and another possible student is being detained as a person of interest. "One is in custody, a second one detained. An injured police officer is being treated, the extent of his injuries are unknown," Harris County Sheriff Ed Gonzalez said in a press briefing Friday morning. Law enforcement officials later identified their primary suspect as 17-year-old Dimitrios Pagourtzis, who is being held without bond on capital murder charges, Galveston County Sheriff Henry Trochesset said later that day. On Friday evening, Pagourtzis was arraigned on capital murder charges, and was denied bail. Abbott confirmed that "one or two" others are being interviewed regarding the crime. According to CNN affiliate KTRK, a gunman walked into an art class and began shooting from what looked like a shotgun. Abbott reported that the shooter had a shotgun and a.38 revolver, both of which were legally obtained by his father. Abbott also confirmed that explosive devices had been found in the shooter's house and vehicle, saying police had found a Molotov cocktail and a carbon dioxide explosive device. Ensuring the safety of investigators means searching premises with these devices must proceed slowly, he said. The governor also revealed that the shooter had turned himself in, despite having written in journals about wanting to commit the crime and wanting to commit suicide. He ultimately didn't have the courage to take his own life, Abbott said. — Dan Snyder (@DanSnyderFOX25) 18 мая 2018 г. — Ignite🔥 (@IgnitedTrueWord) 18 мая 2018 г. US President Donald Trump responded to the incident via Twitter. Speaking during an event at the White House, Trump said that his administration would do everything in its power to stop shootings in US schools and keep firearms out of the hands of people who pose threats. Earlier in the day, US federal authorities from the Bureau of Alcohol, Tobacco, Firearms, and Explosives (ATF) said they were responding to a school shooting in Sante Fe. The school said in an earlier message it was on lockdown following an incident with an active shooter. The incident in Sante Fe, Texas, is the most recent in a series of deadly shootings at US schools, including a massacre at a high school in southern Florida in February in which a former student killed 17 people with an assault rifle that was purchased legally.